The start of the holiday season is finally upon us. 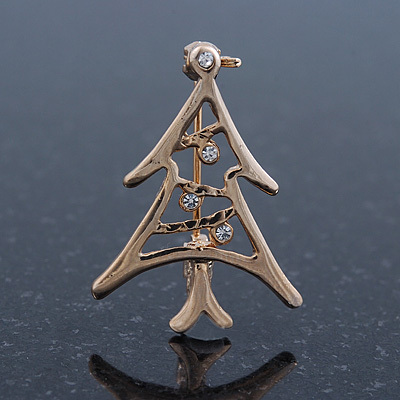 No Christmas celebration is complete without a Christmas tree and our Christmas tree pin is a lovely example of holiday jewellery at its finest. This small contemporary Christmas tree decorated with clear crystals dotted throughout the design of the tree for a dash of sparkle. The brooch made out of gold plated metal for extra shine. It measures about 30mm L x 20mm W. Fastens securely with a metal pin clasp. Keep your holidays merry and bright when you wear our stylish Christmas brooch. Think about ordering one for a friend who shares your love of holiday jewellery when you place this order for yourself.